Yellow Balls, recently observed as early star forming open cluster centre. Yellow Balls, recently observed as early star forming open cluster centre, interpreted according to Quantum FFF Theory. 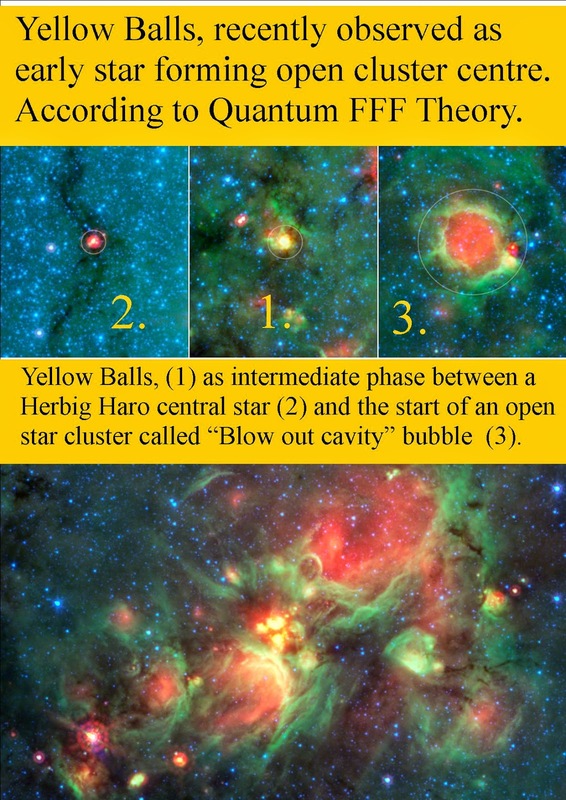 Yellow Balls, (1) as intermediate phase between a Herbig Haro central star (2) and the start of an open star cluster called “Blow out cavity” bubble (3). This series of images show three evolutionary phases of massive star formation, as pictured in infrared images from NASA’s Spitzer Space Telescope. The stars start out in thick cocoon of dust (left), evolve into hotter features dubbed “yellowballs” (centre); and finally, blow out cavities in the surrounding dust and gas, resulting in green-rimmed bubbles with red centres (right). The process shown here takes roughly a million years. Even the oldest phase shown here is fairly young, as massive stars live a few million years. Eventually, the stars will migrate away from their birth clouds. Image credit: NASA/JPL-Caltech. Comet 67P CG and subsurface funnel structures, Hyperion and Coral alike. Observed collimated dust jets spouting out Comet 67P C-G are suggesting a sub-surface funnel structure Photo ESA blog, edited and enhanced by Steve Kasian. 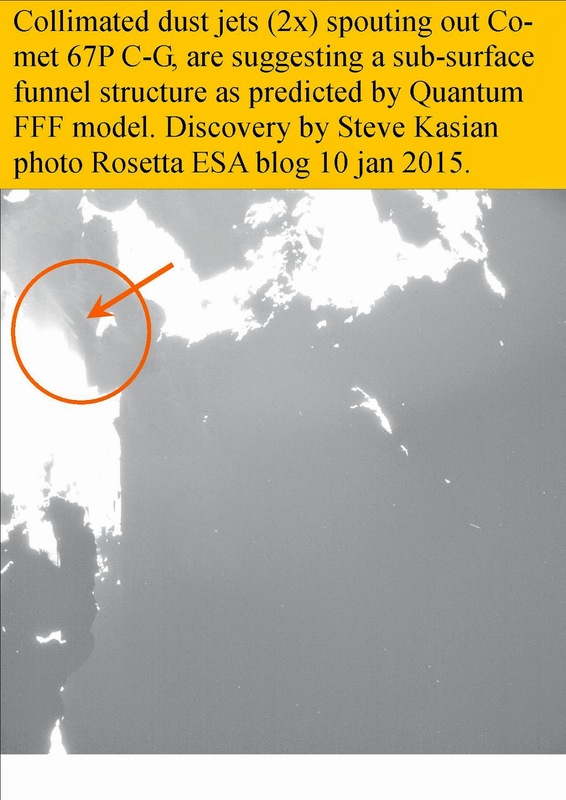 Photo: ESA 10-jan-2015. Flyby anomaly, Pioneer anomaly, Growing earth hypothesis and P-wave related?. According to the Quantum-FFF model, (Function Follows Form) Microscopic Dark Matter (singularity black holes) are proliferated inside stars (sunspots), comets and ball lightning. Recent studies (B. Harris/N. Adams) suggest, that also outside and around earth an equatorial dark matter ring is present as the origin of the “Flyby anomaly” ( B.Harris) or the "growing earth hypothesis". 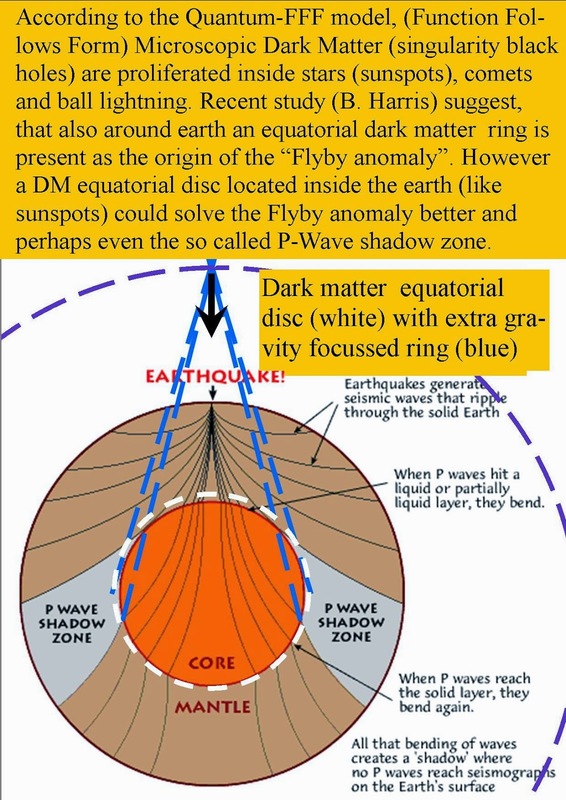 (N.Adams) However a DM equatorial disc located inside the earth (like sunspots) could solve the Flyby anomaly better and perhaps even the growing earth hypothesis and so called P-Wave shadow zone. If sunspots (also DM black holes) have the same configuration, then the pioneer anomaly could be also explained. Secondly the anomalous gravity variations around/ during some total solar eclipses could be explained by a so called lighthouse effect created by two sunspots in line with each other. Such a gravity pencil alike decrease on earth, from the sun could only be observed before and after total eclipse, if the gravity beam is hitting the moon at that moment. Conclusion, the double gravity dip observed by Q.S.Wang and X.S.Yang in the 1997 solar eclipse, has never been seen again due to this peculiar solar sunspot gravity lighthouse phenomenon. Evidence for Dark Matter based plasma, dust and ice production inside Comets like 67P,C-G. and the growing Earth. and others, is a clear sign of great uncertainty about black holes and adjacent subjects. present at the black hole event horizon. entangled and guided in a dual mirror multiversal way. Casimir Dark Energy of 126 GeV recently observed in the LHC at CERN. horizons are needed, an event or Photon horizon and two Fermion repulsion horizons. out of the Higgs vacuum. Pair production as a base for quarks and as such H2 and O and more complex atoms. 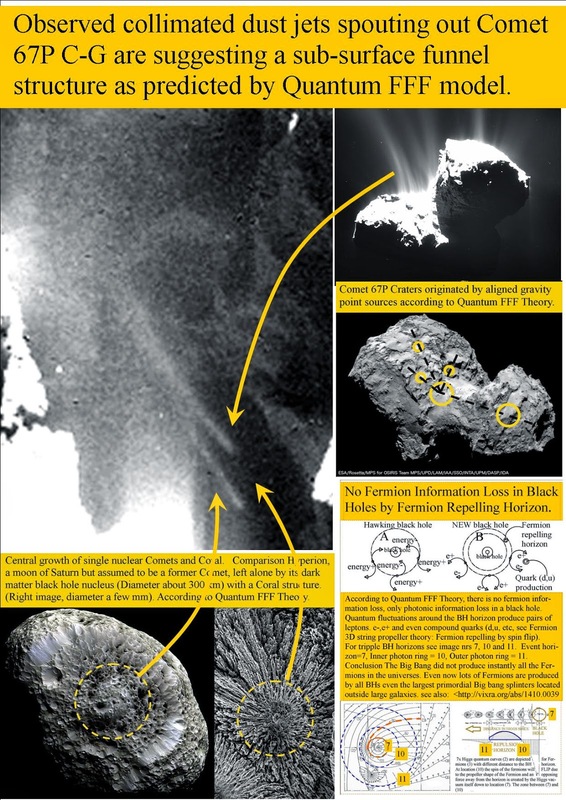 Comet 67P CG, (Churyumov-Gerasimenko) seems to be a unique test bed for this theory. measurements of the Rosetta lander mission. Recent measurements and photos are already suggesting that a large variety of atoms are ejected by the Comet and surface changes seem to be the origin of local crack shaped colour changes. The magnetic field of the comet seems to ring or sing 3 times every minute by the internal tectonic shocks. The dusty jets observed from the so called “Neck” of the comet seem to be a sign for a central Birkeland Alfven current circuit effect on dust acceleration and violating the solar heat erosion theory. also must be able to survive the crash into planets like earth or moons. As a consequence we may assume that all energetic and plasma (new matter) related production processes found around planets and moons could be based on the same process. Examples are found in the water vapour plumes of geysers observed on Jupiters moon Europa. hypothesis (also known as “expanding earth”) as the base for the peculiar shape of the continents on earth. HOWEVER, according to the buried former nuclear Comets it seems to be not a so called dehydration melting process. GPS satellites suggest Earth is heavy with dark matter.